CHARLES HADDON SPURGEON has been described in various ways—preacher, pastor, evangelist, philanthropist, man of prayer—but the ascription educator is not a frequent one. Yet Spurgeon began speaking publicly when teaching a Sunday school class. (He ended up ministering not only to the children, but also to adult teachers eager to hear his exposition of Scripture.) Later, he ran his own children’s school for a while. As the state school system emerged in the nineteenth century, Spurgeon urged his church members to be involved in the emerging school boards. As an educator, he is best remembered, however, for founding a theological college that trained nearly 900 pastors during his lifetime, and that continues today. That Spurgeon would found a pastors’ college is somewhat surprising, since he received no formal theological training. Spurgeon received his education through his parents, his grandfather’s library, occasional dame schools (neighborhood schools taught by a woman in her home), and a year at Maidstone Agricultural College. He entered pastoral ministry as a self-made man. Nevertheless, within two years of coming to New Park Street Chapel in London, Spurgeon drew to himself a number of men who were eager and gifted to preach, yet whose abilities and eloquence could be improved by basic education. At Spurgeon’s direction, in 1855 Medhurst was given a preliminary education under C. H. Hosken, a Baptist pastor at Crayford in Kent, and then began theological studies with a Congregational minister, George Rogers, in South London. A year later a second student was added, and in the first five years (when the college met in the manse of the Calvinistic Congregationalist church) fifteen students received training. In 1862 the Pastors’ College moved to the halls of the Metropolitan Tabernacle and twelve years later moved into its own facilities at the rear of the church. The number of students rose steadily until 1877, when 110 were in training. Many aspects of the Pastors’ College were modeled on earlier Dissenting academies. Yet Spurgeon’s new venture was founded upon three clear principles that together distinguished it from other schools. Educational openness: The College had no entrance examination, and it provided a general education as well as a specialization in theology. For men in their early twenties who had slender academic attainments and educational opportunities, this was an open door. The policy stood in direct contrast to more prestigious London colleges, such as the Baptist College at Regent’s Park. Other Nonconformist colleges took advantage of the proximity of London University, and from the 1840s they entered students there for examinations. Spurgeon never adopted this method. All examinations in the Pastors’ College were set and marked internally, and each student developed as he was able. Many prospective students received preliminary training through evening classes in English, science, foreign languages, mathematics, and classics. These classes were free and open to all Christian workers, but many then entered the two-year course at the college. Thus, no student was debarred through a lack of academic attainment. Financial support: No student was debarred on the grounds of financial handicap. The college held that “When God’s work is done in God’s way, it never lacks God’s supply.” Spurgeon brought into theological education the faith-mission principle that George Müller had brought to Christian philanthropy and Hudson Taylor had applied to missionary service. In the early days, “God’s supply” came from the Spurgeon family budget. From the early 1860s onward the college was administered by the Metropolitan Tabernacle’s deacons, and its main source of income was offerings from church members and friends. There were no endowments and no list of subscribers. The needs were made known, and in earnest prayer the people looked to God to supply. The students received hospitality in the homes of Tabernacle members, and only where their families or friends could contribute anything to the cost of the course was money solicited. Many students were given fifteen shillings a week pocket money, and there were no set fees. This meant the college’s finances were precarious, and only from the 1870s onward were they placed on a more secure basis. In reality the whole venture depended a great deal on Spurgeon’s personality, and when he died, the college faced a period of severe financial deprivation. Nevertheless, if a gifted man could show evidence of God’s call, he would be accepted for training whatever his financial circumstances, and this remains a principle of the college. Theological commitment: The college was founded in stirring times. Traditional beliefs were being challenged by the emerging theories of evolution and biblical criticism. Spurgeon was antipathetic to emerging theological novelties. He also was utterly committed to the traditional Calvinistic interpretation of substitutionary atonement, biblical inspiration and authority, and eternal punishment. Although Spurgeon wanted his students to be alert, relevant, and lively in the context of late nineteenth-century life, he wanted them to be committed to Calvinistic orthodoxy and to be in the vanguard of the fight against modernism. To ensure this, all college tutors were required to be committed to the doctrines of grace and to teach them with dogmatism, enthusiasm, and clarity. (Although Spurgeon and George Rogers, his principal, differed on the manner of baptism, they held unity on central doctrines.) All the tutors were working pastors and thus provided a combined academic-pastoral model for the students. In short, the college’s admissions policy, broad curriculum, practical emphasis, and short course provided a unique contribution to contemporary theological training. Spurgeon was crucial to the success of the college in a number of ways. Teaching: The highlight of the students’ week was Friday afternoon, when Spurgeon informally lectured on pastoral theology and practice. These informative, inspirational addresses became the basis of Spurgeon’s published Lectures to My Students. They describe the pastor’s many duties in realistic detail, emphasizing the work of the pastor-evangelist, whose job was to save souls through the preaching of the gospel. 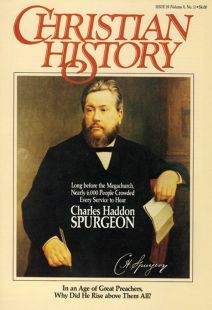 Spurgeon was the instrument of the conversion of over twelve thousand people, and because the college and the Metropolitan Tabernacle were inseparably linked in pre- and post-ordination training, most students learned both in the classroom and in practical experience to be church-planting soul winners. Admissions: When a student applied to the college, Spurgeon conducted the interview, and he determined whether the student would be accepted. No one was refused on educational or financial grounds, so what were the criteria for acceptance? Clearly students had to be committed to the theological standpoint of the college and be prepared for a vigorous two-year course. (This was lengthened to three years after 1880, but many students left before completing the course because of their churches’ needs.) In general, however, Spurgeon wanted people who had been preaching for two years and who had shown proven fruitfulness. He looked for zeal, common sense, humility, and bright personalities. He also wanted students from a range of abilities so that they could minister to the sophisticated of the West End of London and the needy poor of the East End. Thus, spiritual qualities and a proven record were the key requirements. Policy: The administration of the college was in the hands of Spurgeon’s half brother, James Archer Spurgeon. There were no formal staff meetings and no formal council or board of trustees. Thus, Charles Spurgeon’s word was the final authority. Placement: Spurgeon placed his graduates according to requests he received from churches needing pastors. Young men on the point of leaving the college were summoned by “the Governor,” as he was known, and Spurgeon would indicate where he felt it was God’s will that a particular student should go. In this way nearly two hundred churches were planted, and a number of others were revived. After 1880 an increasing number of graduates went overseas to plant churches in the British colonies. When Spurgeon died suddenly in 1892, it became obvious that the Pastors’ College had depended too much on his personality, generosity, and influence in the evangelical world. The college faced years of crisis and had to adjust its admissions, financial provision, requirements, and curriculum. In 1917 the college almost closed. In 1923, however, through the generosity of a family who had been converted through Spurgeon’s preaching, the college was offered the opportunity to become residential. The school moved six miles south to its present home at Falkland Park, South Norwood. Gradually the college’s links with the Metropolitan Tabernacle diminished as it developed its own ethos, council, and curriculum. In the 1940s students began to take university examinations, and the academic repute of the college has grown ever since. The college’s links with the British Baptist Union have also developed, and now most of its students train to be recognized Baptist ministers in the British Isles. The keynote emphases of the college, however, remain the same: evangelical commitment, preaching, and evangelism. In some ways the college is returning to its roots with a new course emphasizing church planting and evangelism. Michael Kenneth Nicholls is vice-principal of Spurgeon’s College in London. Fascinating facts about women in the medieval church.